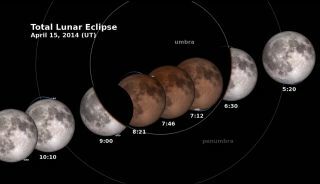 The phases of the April 14-15 total lunar eclipse are shown with GMT timestamps in this NASA image from a video guide. The total lunar eclipse will affect two NASA spacecraft orbiting the moon since they rely on sunlight for power. For most U.S. states east of the Mississippi River, tonight's total lunar eclipse will likely turn out to be a total bust, while in contrast, much of the central and western United States will likely get a fine view of the "blood moon" in all its brilliance. The first total lunar eclipse of 2014 occurs in the overnight hours tonight (April 14) and will be visible across most of North America, South America, Hawaii and parts of Alaska. Depending on your location, it begins either late tonight or in the wee hours of Tuesday, but as with every skywatching event, you can only see it if Mother Nature cooperates. Along the U.S. East Coast, a slow-moving cold front stretching from western New York State south-southwest into the central Gulf of Mexico is likely to bring considerable cloudiness to much of the eastern-third of the nation. Generally speaking, anywhere east of a line extending from Sault Ste-Marie, Mich. to Paducah, Ky. to Baton Rouge, La. will have poor sky conditions for getting even a fleeting glimpse of the darkening moon during the predawn hours of Tuesday. This NASA graphic shows where the total lunar eclipse of April 14-15, 2014 will be visible from. The lunar eclipse coincides with April's full moon and is the first of four total lunar eclipes (a tetrad) between April 2014 and September 2015. The exception might be inland sections of central and south Florida where the clouds may be thin enough to allow for some visibility of the shady lunar drama. Showers and scattered thunderstorms — a few possibly strong and gusty — could bring as much as one-quarter to one-half inch of rain across parts of the Ohio and Tennessee River Valleys, with as much as an inch over the Florida Panhandle, while snow will fall over parts of northwest Ohio and Michigan. Over the central and western United States, high pressure over the plains states is expected to bring mainly fair skies. However a cold front draped over the Pacific Northwest into northern California, could bring some cloudiness that may hinder the view. Near and along the coast of Washington State, spotty showers could fall, but for the most part, the western two-thirds of the United States will be dry, tranquil and perfect for viewing tonight's moon show. Lunar eclipses occur when the moon is in the full moon stage and passes through part or all of the Earth's shadow, darkening the moon's typically bright glow. During a total lunar eclipse, the moon is entirely immersed in Earth shadow, and can take on a dusky "blood red" color due to the scattering of sunlight through the edges of Earth's atmosphere. Such moons are sometimes nicknamed "Blood Moons." Timetable for the 12 stages of the eclipse: AKDT = Alaskan Daylight Time. HAST = Hawaiian-Aleutian Standard Time. (Arizona does not observe daylight time, so use PDT). An asterisk (*) indicates p.m. on April 14, but all other times are a.m. on April 15. Dashes means that the moon has set below the horizon. Tonight's lunar eclipse is the first of four consecutive total eclipses of the moon between April 2014 and September 2015 in what scientists call a lunar eclipse "tetrad" series. The next total lunar eclipse will occur on Oct. 8 and is also expected to be visible from much of North America. Editor's Note: If you snap amazing pictures of the total lunar eclipse or Mars, you can send photos and comments to managing editor Tariq Malik at spacephotos@space.com.